When referee Kevin Johnson blew the final whistle that confirmed Bradford City had beaten Shrewsbury Town, a huddle of celebration was formed inside the Bantams dugout, headed up by Michael Collins, Greg Abbott and Martin Drury. Glee, relief, elation – it was an outpouring of emotion, to commemorate a milestone moment. The June unveiling of Collins, Abbott and Drury as City’s new coaching team arguably ranks as the most underwhelming managerial appointment in the club’s history. Shock was quickly followed by despair. Questions, doubts and conspiracy theories have been given oxygen to thrive. Typically, a new manager or head coach begins life in the dugout aided by a wave of public goodwill. But in contrast, it’s been a rough ride for Collins, the rookie head coach. He had – and still has – a lot to prove. This was a big, big moment. You could feel it in his release of joy at the end. And you’d need a heart of stone not to have enjoyed the look of pure delight from starting off in the best possible way. Huddles were the theme of the day. Almost exactly two hours earlier, Collins’ new charges finished off the pre-match warm up in an eye-catching manner. Each and every member of the squad joined the coaching team in a huddle right in front of the away end, before turning to the fans to show their appreciation. They were greeted by a huge roar of approval from supporters. This was Collins’ and the players proactive attempt to begin healing the fractured atmosphere around the club that, over the first half of 2018, saw relations between player and supporter badly damaged. It was about bringing the club together again. And it set the tone for an afternoon of change and intrigue. The communal pre-match huddle was a precursor of the new-look Bradford City displaying highly impressive levels of commitment to the cause. Collins spoke post-match of building a team that mirrors the city of Bradford’s values of working hard, and emphasised the high priority he gives over having the right characters in the team. It was as though Phil Parkinson was back in the building. It would certainly appear that Collins, who is an avid student of the game, has looked into the recent history of what made Bradford City successful. Not that the style of play is from any Parkinson handbook. Collins’ philosophy can be summed up in three simple words – attack, attack, attack. He may only favour playing one up front, but the 3-4-2-1 formation employed is full of positive intent. The sight of Shrewsbury right back James Bolton struggling to bring the ball out when level with his own penalty area, because Adam Chicksen was closing him down, was striking. Especially given it came in only the second minute of the game. The pressing, high-line approach from City forced Shrewsbury onto the back foot for the first half hour, with the Bantams profiting when George Miller produced some great work hustling Bolton and running along the byline, before pulling the ball back for Jack Payne to calmly steer into the bottom corner. A goal that was the result of skill and persistence. It summed up the team. City have clearly done well to secure the services of Payne for a season. He is so skilful on the ball, likes to take risks to create openings, and has a deft vision of passing that occasionally his own team mates struggled to keep up with. He should really be playing at a higher level. Payne thrived in a free role behind Miller, who himself proved the perfect foil by tirelessly working the channels and making space. It was mightily encouraging from City. Behind Miller and Payne, Sean Scannell showed flashes of flair that kept Shrewsbury hemmed back, whilst wing backs Chicksen and Joe Riley charged up and down the pitch with impressive stamina. The width they provided helped City to overload the Shrewsbury full backs. With all but the three centre halves camped inside the Town half when the Bantams had possession, there was always a spare man popping up in space for a pass. Josh Wright and, to a lesser extent, Hope Akpan, dictated the tempo. Despite their own summer of turmoil, Shrewsbury remain a decent side and came back into it before half time. They’re on the cusp of losing six of their play off final starting XI, but their retention of Shaun Whalley leaves them with one of the best wingers in League One, and he caused City problems. That continued into the second half, where the downsides of City’s formation – the gaps left between centre backs and wing backs – provided Shrewsbury with large pockets of space. Yet City defended well, lead by the outstanding Anthony O’Connor, who barely put a foot wrong all afternoon. In a game of 11 promising Bantams debuts, the Irishman was the standout performer. Tough in the tackle, an excellent reader of the game and comfortable on the ball, he already looks like some signing. Alongside him, Nat Knight-Percival and Kelvin Mellor were generally solid too. Matt Kligallon’s omission from the matchday squad is curious and could lead to an interesting few days, ahead of the closing of the transfer window. What helped City was Collins’ decision to change the formation around, and go for a conventional 4-4-2 formation, with Chicksen and Mellor as full backs. That led to Eion Doyle being brought on for his debut – the midweek signing from Preston should have scored two goals, but otherwise made a positive impact – and City regained control of the game. Scannell burst back into life on the right hand side, providing the strongest indications yet he can become the successor to Mark Marshall that was badly missed last season. Collins deserves credit for the effectiveness of his tactical tweaks. It became end to end, with Shrewsbury’s own substitute – a certain Alex Gilliead – also causing problems. Both sides hit the woodwork a couple of times. That desire to attack meant Collins resisted the natural urge to close up shop and see out the game. By the end, he had brought on Tyrell Robinson and Sherwin Seedorf – leaving Shrewsbury’s attempts to throw everyone forward, in search for an equaliser, compromised by the very real threat of the City counter attack. To be so gung ho in the closing stages of a game you’re winning, away from home, was risky – very risky. Had Shrewsbury snatched an equaliser at the death, the post-match criticisms of Collins’ tactics would have followed a predictable path. But ultimately, the 32-year-old was rewarded for his bold approach. City merited the three points. And it sets them up nicely for next week’s Yorkshire derby with Barnsley. It is only a start. There’s a long, long way to go, and far bigger tests await Collins. But equally, more than 1,500 City fans turned up at Shrewsbury unsure exactly what to expect, with a heavy defeat feeling plausible. Working for the Pulse today, we spoke to the coaching staff and even Edin Rahic before kick off, and their abundant excitement could not disguise their understandable nerves. This was a step into the unknown for everyone. And it might have been a rocky start. That it went much better than worst fears is a major positive. 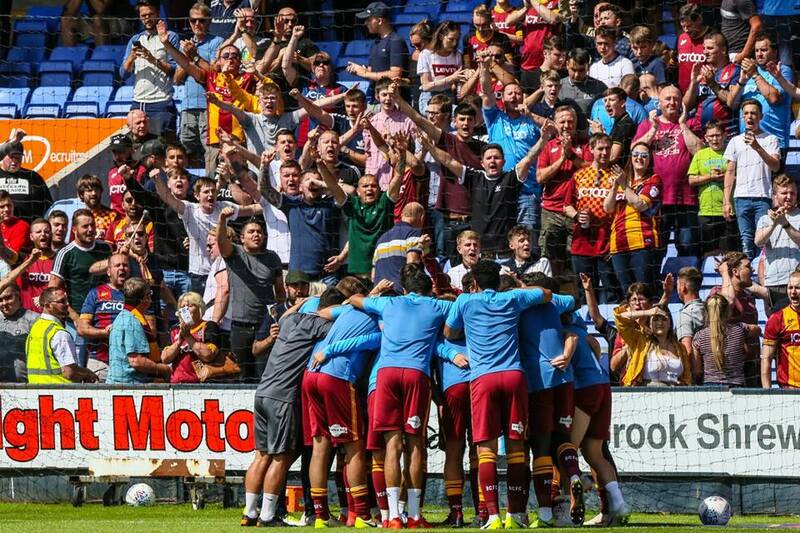 From the pre-match huddle to the victorious celebrations at full time, this felt like an afternoon where Bradford City started to feel united again. That the scars of the past can be healed. And that the uncertainty of this season need not be a bad thing. The style of football, and the engagement levels of the players – this felt a world away from the nightmare end to last season. It’s not time to get carried away. It could all yet go terribly, terribly wrong. But this victory is something to build on. 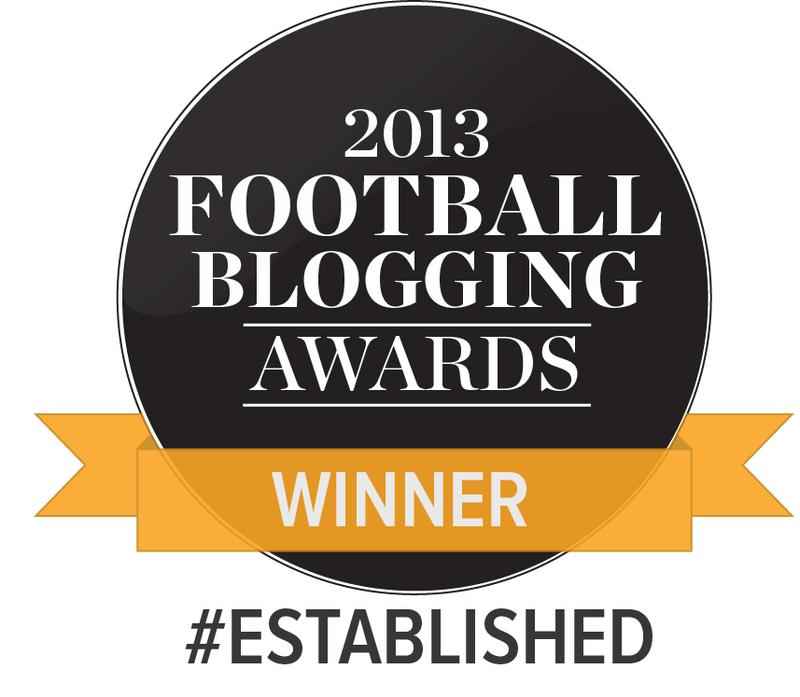 An afternoon where Bradford City demonstrated their potential, and where Collins showcased his aptitude to do the job. He’s offering up something very different in the style of football, but aligning it to old fashioned values that were the bedrock of recent achievements. The months ahead should prove anything but dull. It’s great to be reading game reports again especially as I was working yesterday so couldn’t travel to Shropshire! From your carefully chosen words, there is a similarity in the approach that Collins is adopting to that taken on by Gareth Southgate with England. By this, I mean trying to forge a better link between players and supporters. Also, a mixture of a high tempo start mixed with attacking play and hard work. We know that it’s very early days still for Collins, however I think that most of us appreciate that he has been presented with an opportunity and despite not being first choice he’s going to give it his best shot. A long way to go this season with bumps and bruises to be had along the way. But let’s hope that the bond between supporters, the players and the hierarchy can be re-built. Richard, you have proved what a true City fan you are. You criticise, complain, worry, but you never leave them. Congratulations. Really enjoyed the match and the whole occasion..thought the whole squad stood up very well and a great attacking display for decent parts of the match. Rode our look at times but i would rather approach the season in this way than sit back scared and timidly trying to survive. Now onto the summer holiday do will miss 3 home matches and the club’s rebuilding of what was an appalling season at VP last time. Think it will be different now especially with Mr Doyle about to be properly unleashed. Fantastic to read of a throughly positive day all around.A whole new team giving their all. The togetherness and hard work was there to be seen. Even in the unrelenting heat they worked incredibly hard, which is a great sign. There were also good signs in the quality of players on show, confident and comfortable on the ball. The start of the game saw everything rolled out from the back and passing built from the back. Even with Shrewsbury pressing it didn’t seem the defenders were too flustered. As the game wore on, we gifted Shrewsbury far too much possession with O’Donnell in goal kicking the high ball out from goal kicks and from his hands. The vast majority of which were won by the bigger Shrewsbury defenders, gifting them the ball and allowing them to attack again, finding a way around this would have nullified a lot if their threat. Although we defended confidently, I thought we were just giving them too many chances. I though Joe Riley started very well, but slowly faded and bringing Doyle on gave us more of a threat and we managed to have more control of the ball after the change. In all honesty, I thought the 3 attacking substitutions actually helped us see the game out more than shoring up at the back would. We had more men higher up the pitch. I struggle to remember another time we have seen out a 1-0 win so comfortably. The last few minutes those extra attackers were able to keep the ball in down in the corners at Shrewsbury’s end and run down the clock. It made a refreshing change from the usual hanging on and hanging on as the other team swamp our penalty area, inviting attacks. Great game, great to have footy (and hopefully City) back and great atmosphere. Note to the fans though, we need to sing and shout more when the team are under pressure. Everyone clapping and cheering at the start, when we’ve scored or at the end is great, but when Shrewsbury had the ball and were clearly on top, our end was silent. It annoyed me people just sitting back in the sunshine and waiting for something to happen, for us to improve, lets make it happen ourselves.. It is those times they needed us to sing and make some noise. The game was perfectly set up by the pre match team huddle. Never have I witnessed such a situation where every player and member of the coaching staff were involved in a showing of unity. It galvanised the fans who in turn gave their full support from minute one to ninety five. So many excellent debuts and proper leaders on the pitch in Josh Wright & Anthony O’Connor shows how good our recruitment has been. Most pleasing aspect about the day was knowing the joy that both the chairman and the manager must have felt at the final whistle.